Damon Albarn has long had a variety of musical projects, but he seems especially busy these days, what with his DRC Music album, recent opera, planned solo disc and new band with Flea. Well guess what? 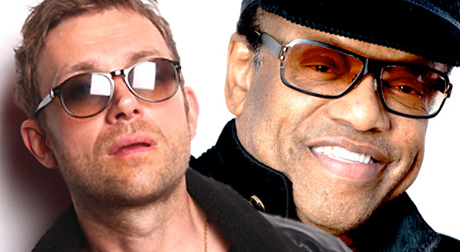 The Blur/Gorillaz mastermind has also been occupying his time by producing an album for senior citizen soul singer Bobby Womack. It's going to be out on XL next year. Because Bobby guested on the Gorillaz record [2010's Plastic Beach] and him and Damon toured a lot together they had the idea of doing something new. Me and Damon worked together on the DRC Music Project album [Kinshasa One Two], so it kind of naturally came together to do something with Bobby. We're just getting in finished actually. We should hopefully get it finished in the next couple of weeks. It's been wonderful. We've got 15 or 16 brand new songs made [with an] amazing quality of writing and really interesting production. He's an incredible voice, so I'm really looking forward to creating a platform for people to hear him. As a co-production thing with me and Damon it's been great and it's been an amazing experience. Hopefully people will dig the music. Russell went on to explain that it's a "very modern soul record" and compared it to buzz-worthy R&B crooners like Frank Ocean and the Weeknd. Perhaps even more exciting is the fact that Womack reportedly co-wrote many of the songs with Albarn. As Pitchfork points out, Lana Del Rey previously tweeted, "Love the song I've done w Richard Russell, Damon Albarn and Bobby Womack." In other words, don't be surprised if that track pops up here. Stay tuned for more details about this forthcoming release.